Last night we held our annual Gingerbread House Decorating Party with our little friends. Which is basically my favorite night of the year. It always turns into complete chaos once 13 kids are let lose at a table full of frosting and candy, so we were only able to take photos during our party prep time! Since most of the kiddos who came to the party were little, I built the houses the night before. Lake decorated the table with all the decorations, which included Marshmallows, Dots, Chocolate Swirls, Candy Lights, Cinnamon Dots, M&Ms, Skittles, Sprinkles, and Red and Green Gummy Bears. Once the kids were done decorating, we put the houses in individual kraft bags so they could take them home. Each of the kids had drawn another's name to gift a book to, so we put on some Holiday music and opened presents. But the highlight of the night was Adam losing TWO teeth! 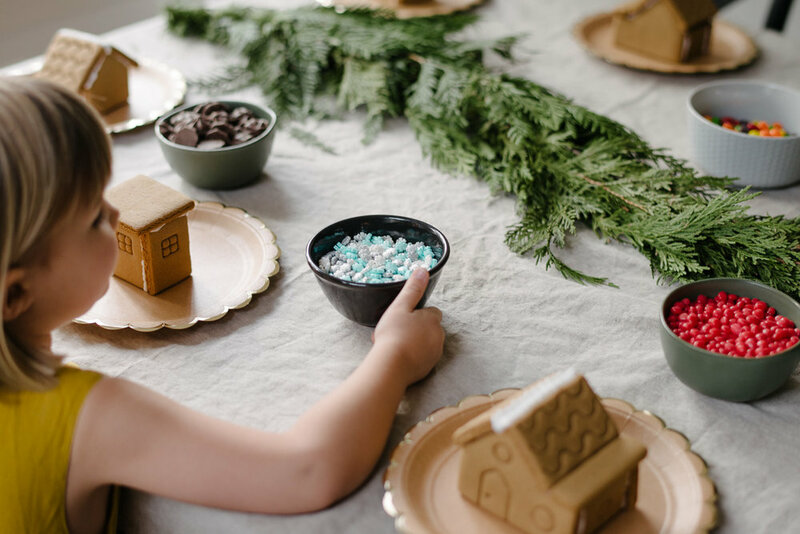 This is one of our favorite holiday traditions, decorating with friends, snacking on candy, and embracing the chaos of a sprinkle covered kitchen floor!